How exciting! The Food52 cookbook is now available. I’m so proud to be a part of this great group of home cooks and pleased as punch that two of my recipes are featured. I think the best companion in your holiday kitchen would be this cookbook, so I’m giving one away. I just have to share the love. Food52 is an amazing recipe site, and represents a generous, funny, warm community of cooks from around the world. Even more amazing is the group of local cooks who have come into my life because of this site. Six times now the group has come together for the most awesome potlucks I’ve ever attended. 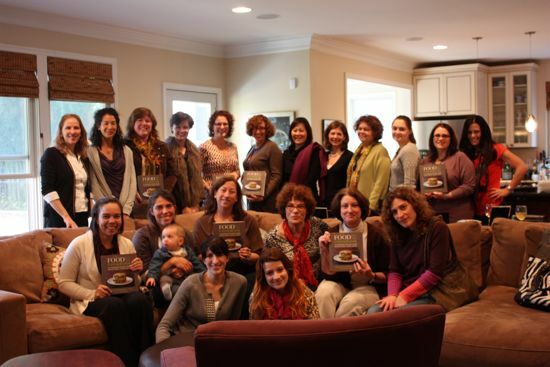 We gathered last week to celebrate the publication of the cookbook. Don’t we look like we just ate a great lunch? This is one talented group of cooks. While I shudder at the thought of most potlucks, the anticipation of a Food52 DC Potluck makes my mouth water. 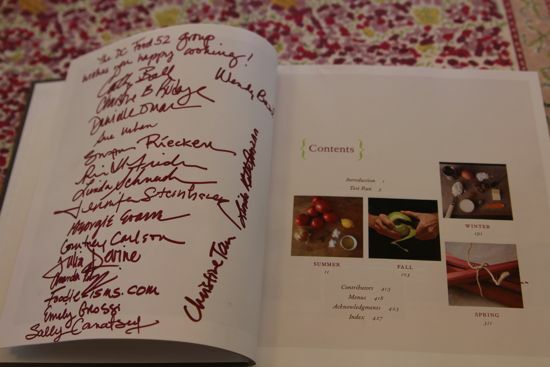 At the party, all the DC Food52 cooks (in attendance) autographed the cookbook. We’re entering into the season of eating. I’m skipping Thanksgiving preparations and heading to an Inn but that doesn’t keep me from dreaming. Here are a handful of fantastic recipes from Food52 that would be a great addition to your Thanksgiving festivities. Sweet Potato Gratin – I made this for the potluck and it was DIVINE. Shaved Brussel Sprouts Salad – This is lunch several times a week, now that brussel sprouts are in season. Ciabatta Stuffing with Chorizo – While amazing with your turkey, the next morning, you will eat happy with the addition of a poached egg. Grilled Brussel Sprouts – I am officially obsessed with this recipe. Rustic Cauliflower Bake – SO freaking delicious. Retro-y great casserole side dish for your holiday table. Ginger Molasses Pumpkin Bread – So quick and simple and all the ingredients are likely to be in your kitchen. Try a slice toasted. Just leave a comment and tell me about your favorite Food52 recipe(s.) Thursday morning, one week before Thanksgiving, I’ll select one commenter using Randomizer on Thursday. Just check back to see if you’ve won, get me your address and I’ll pack up the book, plus a treat from my pantry, and you’ll have it in time for Thanksgiving. Good luck! I LOVE Brussels Sprouts and try to eat them whenever possible, hwoever the Ginger Molasses Pumpkin Bread sounds too good to pass up! The Food52 recipes that have made it onto my “Arlene’s Top #1 Recipes” list are the shaved brussel sprouts salad, the gazpacho with peppadew, caramelized pork banh mi and Ian Knauer’s sticky ribs. Can’t recommend them enough! I really enjoyed some of the soups I have found on Food52 but my favorite is the Thai Curry Butternut Squash Soup. It is awesome. I love browsing them all, every time it makes me want to go straight to the kitchen and start cooking. The book looks lovely. The Ciabatta Stuffing with Chorizo sounds so delicious! I drooled over just about every recipe in the root veggie contest, but the mapled beets will be the next one I try. I bought this book and love love love it! Pick one? You must be kidding! Mrs Larkins Butternut Squash Sage Scones are gorgeous! And, we love Jennifer Perillo’s Summer Farro salad. You want me to pick one? If I go pour over the site I’ll miss someone, so I’m just going to go from memory and I really liked Jen’s Pork Burgers with the slaw. Oh goodness it is so hard to pick just one, but your Memories of Main Blueberry Muffins come to mind – We LOVE them. The grilled brussel sprouts sound amazing!! Grilled brussel sprouts…not a big BS fan but this one bought me! I LOVE Food 52 and have printed out so many recipes, I need to just get the book! I haven’t tried it yet (just found the recipe yesterday), but their Pear Soup with Pancetta and Blue Cheese has just got to be fabulous! Just one? The Rustic French Honey Cake. Mostly because I’d never seen a recipe like it before. Huge hit. The rustic cauliflower bake looks amazing!! I can’t wait to try it…and all of these recipes! I love the pecan pie with star anise and the sausage stuffed mushrooms and how food52 brings us all together! I need to know why it,s called food52. Where to even start? My favorite this minute (may even change before I finish typing) is the grilled brussel sprouts — a revelation! My “go to” recipe this summer, both during and after the cucumber glut (!) were the food52 Lacto-Fermented Pickles with Garlic Scapes. I couldn’t make enough to keep up with the household demand! Definitely am trying the sweet potato gratin! Susan! Congratulations, you’ve won the Food52 cookbook! Please email me your mailing address pronto so I can send it out right away. I make marshmallows every year, and this year I am excited to try the Chocolate Swirl Cinnamon Marshmallows from notlazy.rustic. Roasted Sungold and Pear Tomatoes with Fontina and Thyme was to DIE for. Perfect for any meal, setting, mood. It’s definitely my favorite! I really appreciate the gluten-free baking options that I learned about, including the rhubarb cake that won a recent contest. Jennifer Perillo’s tomato jam is utterly amazing. It won a spot in the cookbook and for many worthy reasons. I love the Quinoa and Kale Salad that won the New Year’s resolution contest – but honestly, there might a dozen others (Not Barefoot Contessa’s Fish Pasta…I could go on). Requested multiple times by both my husband and son! I recently made a spatchcocked roast chicken recipe that I found on food52 and it was THE BEST roast chicken I’ve ever made. I’ve bragged about it to everyone I know! I would LOVE this cookbook! I loved all the sausages I made for Charcutepalooza, but your lamb merguez was the best! Joyce Goldstein’s fennel sausage came close especially since I love the flavor of fennel, but your Merguez tasted just like I remember it should be and I could never have created that myself. What I really want to know, though, is where do you find the time??? Hard to pick a favorite! But I’m missing summer and thinking of the “Late Summer Plum Cake” and “Simple Summer Peach Cake” – both mouthwateringly delish! Congrats on such a beautiful book. I love Jennie’s pear soup with Pancetta & Blue cheese. P.S. – I have loved watching the charcutepalooza challenges unfold this year (even if I have only been staring at them through the window). Rustic cauliflower bake is IT!! I always go to the Food 52 site for recipe ideas! I have so many favorites but today I will pick Arugula, Pear and Goat Cheese Salad with Pomegranate Vinaigrette. Oh! The Rustic French Honey Cake! I love these small, intense cakes! Amandas Peach Tart which I have made with many different stone fruits comes to mind, Only because I just finished the last slice made with plums. The recipes are too many to mention, but all excellent. I second the question how do you find the time? My favorite Food 52 recipe…wow. the recipes here are amazing,and the website is soooo …. interesting! this Shaved BrusselSprout Salad immediately got my attention because I have never done anything else with brussel sprouts but boil /steam’em. I loved the baked carrot “fries” but I compulsively check the website daily and have a folder of other things I want to cook. Stuffing for sure. I love it! GRILLED BRUSSEL SPROUTS!!!! They are DIVINE!!! And I LOVE their Squash Gratin!!!! I made it this year for the first time, for some non squash lovers, and they, and I, LOVED it!!!! Wow, all the recipes sound great, especially the stuffing! The stuffing is wonderful, and I can’t wait to try the Cubano Mixto sandwich! The cauliflower is close, but I would have to go with the brussels sprouts! YUM! LOVE the grilled Brussels sprouts! These even tempt family members who normally say they don’t like sprouts. And I’m looking forward to trying the sweet potato gratin, too! Congratulations on the beautiful book. aw, the mushroom soups, mushroom lasagna, sauteed myshrooms-anything mushrooms! my favorite food 52 recipe is scallops with tarragon buerre blanc! it is worth every moment spent trying to work off all that butter. Absolutely divine. Wow! The cookbook looks fabulous and the dishes looks scrumptious! I hope I get this book for my birthday which happens to fall on Thanksgiving this year! You know I will be making the “Russ Parsons’ Dry Brined Turkey” for sure!! I really want that ginger molasses pumpkin bread recipe! I just made the butternut sage scones (with your cranberry raspberry pecan conserve) and they were both amazing! I have to try that ginger pumpkin bread too! I actually got to taste Cathy’s sweet potato gratin and it was fantastic with her homemade bacon and creme fraiche. It was divine. I went back for seconds. my husband and i love cauliflower. i would love to try the rustic cauliflower bake. The roasted applesauce looks like an interesting departure from the norm! What a fabulous cookbook! One of my favourite recipes would have to be the Rustic Cauliflower Bake. I like Food52 to look up recipes to use with the vegetables I get every week from the farm share. Still getting veggies….this is the last week! Looks like a great book. I like any recipe including beets! i love the cheddar biscuits with the bacon jam recipe. Can’t wait to get the cookbook! Congratulations, Cathy! – your very proud cousin, Laura. I am finding it very difficult to pick just one recipe but will have to say that the Ginger Molasses Pumpkin Bread sounds mouth watering! I love the “Herbed Beef Skewers with Horseradish Cream”!!! I love Food52. Duh, who does not? Favorite recipe honors are shared by Shaved brussell sprout salad and addictive asparagus. Both will be seeing table time this Thanksgiving weekend. Food 52 is great, I’d love to add this book to my collection! Favorite recipe is Savory Tarte Tatin with Winter Vegetables….that stuffing is looking pretty darn tasty too! Wow — this is so much fun to read. Thank you, Cathy, for being such a wonderful part of FOOD52. And thanks for celebrating the book. We are so proud of everyone who contributed and feel the book is important proof of the power of community. Rustic Cauliflower Bake will be on my Christmas table for dinner! Just ordered this book as a Xmas gift for a friend who loves to cook. Looks like an AMAZING book to have!!! Where to start? It’s hard to pick a favorite Food52 recipe. But if I have to, I would choose Sunday Pork Ragu. It’s a time commitment and required knowing a chef/farmer to find pork neck bones, but it was so tasty. The cookbook looks incredible and the talent of the people in the food52 community is really remarkable. I think I could get behind those grilled brussel sprouts! Brussel sprout recipes look awesome! My fave of the moment is the broccoli rabe with lemon and cream, posted by Amanda. My daughter loves it and with extra lemon juice and cream it makes a great one dish meal with pasta. I found your website while searching for recipes here and there on the net and am so glad and lucky that I landed here! Such an informative place, tons of wonderful recipes and great tips . Makes me want to take up cooking with a new found passion! The cauliflower bake!!! For sure. Canadian Thanksgiving was a while back, but thats no reason not to make a big meal this weekend..
Hello Ms. W! I feel like i know you between you and food52! I’ve been following both your and Food52 for years now (although I’m pretty quiet) I just got my Cauliflower, etc. and love the ingredients in the Rustic Cauliflower Bake and am going to make it tomorrow morning! YUMMY! So ok, on a different note, I was going to make your Challah Stuffing for T Day tomorrow, ordered the Challah from Panera Bread to pick up this AM so I had time to dry it out, and they had Ciabatta, not Challah for me! Can you use Ciabatta? So now I’m thinking what will be Plan B? I think I will go with my regular stuffing, but next year will start earlier to avoid frustration. Have a great Thanksgiving Cathy! Hi Paulette, Thanks for the nice comment! The challah stuffing is my favorite, but it works just as well with other breads. They need to be stale, or just toasted in the oven until crisp. My mother made this stuffing with Pepperidge Farm stuffing in the bag for years. Happy Thanksgiving!